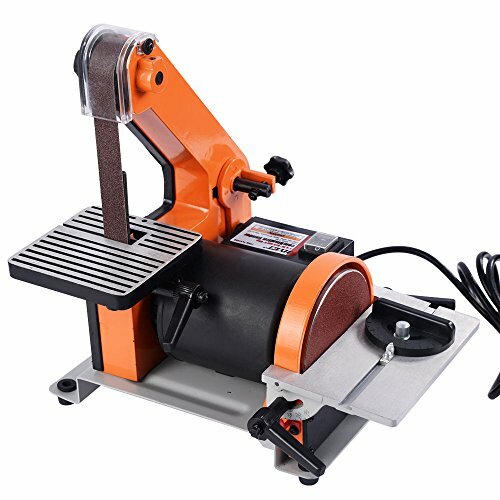 【High Quality Material】This disc sander is made of heavy duty steel. It is durable and can be used for a long time. There is also a strong base on the disc sander, which can prevent any heavy vibrations when you operate. It provides extra stability and safety. 【Convenient Design】Both belt and disc sanding tables can tilt 45 degrees. And it is also equipped with the quick-release belt tension lever, which is easy and quick for you to change the belt. It makes your work more convenient. 【Dust Collection Port】This disc sander is equipped with a dust collection port, which can minimize clean-up of saw dust and debris. It can keep your work environment more clean. 【Easy to Assemble】All assembly hardware is included. Clear and brief instruction make it much easier to put together. And no professional tools are needed, which can save much time for you. 【Multifunctional Use】With a powerful motor, it can be used for small and large sanding operations on various materials. And it can intricate contour sanding and shaping to fast stock removal.